The Nova Tactical pump shotgun features pump action-reliability, ghost ring sights, steel skeletal framework over-molded with high-tech polymer, drilled and tapped receiver for weaver 423M base, and forend shell-stop button. 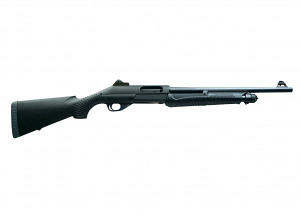 The Nova Tactical is all you need, and nothing you don’t in a defensive shotgun. Fixed cylinder choke, 7.2lbs.